ACON – GENESIS- Workshops for newly diagnosed gay men. These workshops are for gay men who have been newly diagnosed with HIV within the last 2 years. They are designed to make sense of any issues which confront you after diagnosis. It’s also an opportunity to meet other men in the same situation and is conducted in a safe place. GENESIS is a collaboration between ACON and Positive Life. 6 – 8th February 2015 and 17 – 19th April 2015 at ACON Sydney 414 Elizabeth Street Sydney. 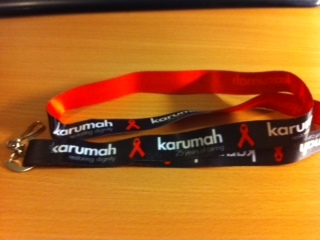 Support Karumah by purchasing one or more commemorative lanyards. This two day training is on the 16 – 17th February at the Family Action Centre, University of Newcastle NSW. Cost $350.00. Come and learn how ABCD is a powerful approach to community work that focuses on discovering and mobilising the resources already present in a community. ABCD is a strong approach for supporting a productive and inclusive life and recognises that people learn best by learning from their own experience.